After searching endlessly for a Crème Brulee recipe, I can across this Chocolate Version. 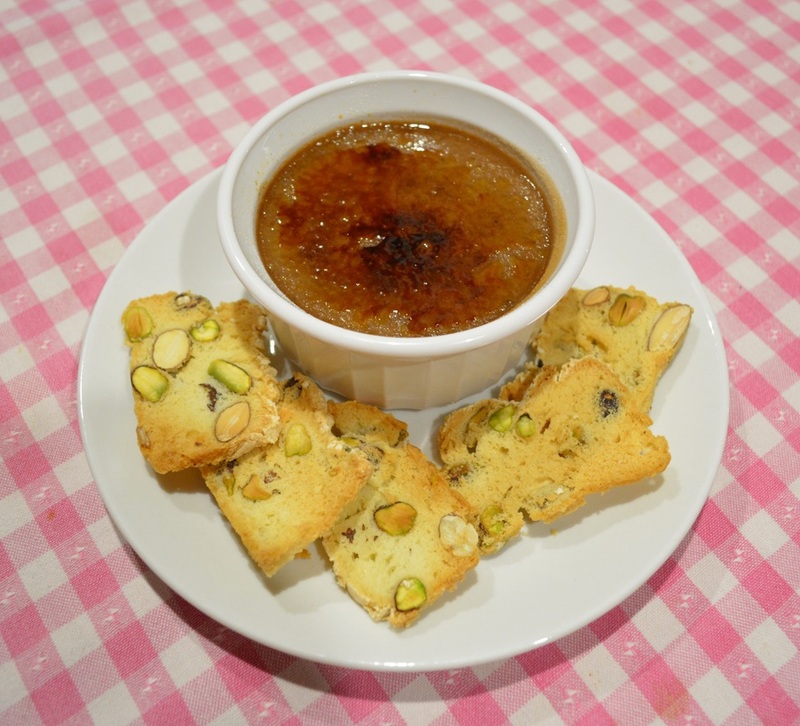 Now I love the original Crème Brulee recipe, it is so good, but I figured why not try the chocolate version. How could it be bad. Well, it wasn't bad, it was brilliant. It is such a lovely chocolate pudding/custard, it is divine. It is so smooth, every mouthful is pure bliss. You should have seen my kids go for it, they loved it. This is a perfect dessert. It will please any chocolate lover out there. And the best thing, it is so easy to make. I made mine in 185ml ramekins which makes 5 brulees, make them in 150ml ramekins or teacups if you need to make 6 brulees. I served it with my mixed nut biscotti, as it is a great way to use up some of the egg whites, but serve it up with some fresh berries if your prefer. So if you are out to impress your family, your partner, your friends or you just want to make it for yourself. Give this a go, you will not be disappointed. Place the cream and milk in a medium sized saucepan. Place over a medium-high heat and bring almost to the boil (do not allow to boil). (To test if thick enough, dip a wooden spoon into the custard, run your finger along the back of the spoon. If the trail stays intact, the custard is thick enough. If it runs or bleeds into the mark your finger left, it needs longer). Pick up the softened gelatine sheet and squeeze out any excess liquid. Add the gelatine sheet and the chocolate to the custard, and stir until the gelatine has dissolved and the chocolate melted. Just before serving, sprinkle caster sugar over the whole surface of the custard, making sure there are no gaps. 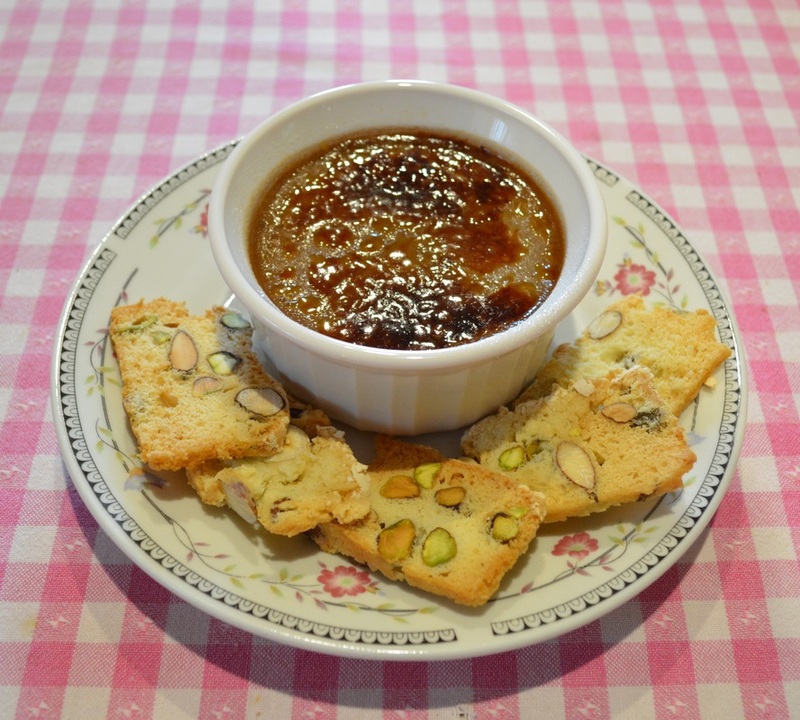 You generally need about 2 teaspoons per brulee, but that does depend on the ramekin you use and its surface area. Using a kitchen blowtorch, heat the sugar until bubbles and turns golden brown. Allow to cool for a minute or two to set before serving. I like to serve it with my mixed nut biscotti but you can also serve it with fresh berries as it adds colour and tastes amazing.